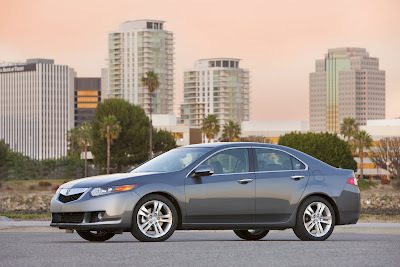 "With strong V-6 power, the 2010 TSX can go toe-to-toe with the top sports sedans in its class," said Jeff Conrad, vice president of Acura sales. "Matched with new 18-inch wheels and revised suspension, the TSX V-6 is proof positive that a smart vehicle choice doesn't have to be a boring vehicle choice." Designed as a desirable choice for luxury sedan buyers, the second generation TSX is larger, more agile, more performance minded and even "more Acura" than ever before. 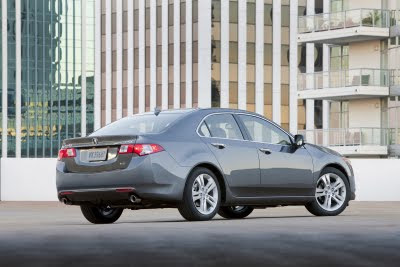 The latest TSX has evolved to offer more comfort, convenience and safety. It does so with expanded luxury and electronic features, a wider stance for more agile performance and advanced safety systems. 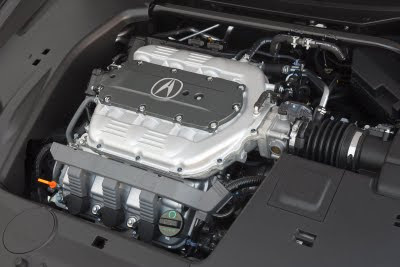 While the TSX with 2.4L I-4 engine provides a spirited driving experience, pushing the performance envelope is an available V-6 package which further defines the TSX's sporty driving character that has become an Acura trademark. In addition to added power, the V-6 model also receives exclusive suspension tuning, larger diameter wheels and tires along with brake system upgrades. For 2010 the TSX is available with two distinct powertrain choices: a high-revving 2.4L DOHC I-4 with iVTEC and a new 3.5L V-6 with strong mid-range torque. The available SOHC V-6 develops 280 horsepower and 254 lb-ft of torque thanks to a high 11.2:1 compression ratio, VTEC® valvetrain control and a dual-stage induction system contained within a lightweight magnesium intake manifold. The V-6 engine yields a linear torque curve with emphasis on the rpm range most commonly used during day-to-day driving. The 3.5L V-6 meets California's CARB LEV II ULEV emissions certification and delivers an EPA estimated* city/highway fuel economy of 18/27 mpg. The performance and flexibility of the 2.4L I-4 is credited to a high compression ratio, "intelligent" iVTEC® combined with Variable Timing Control™ (VTC™), and excellent intake and exhaust gas flow. The 2.4L I-4 powertrain is available with a choice of two transmissions - a standard 6-speed close-ratio manual transmission or a Sequential SportShift 5-speed automatic. 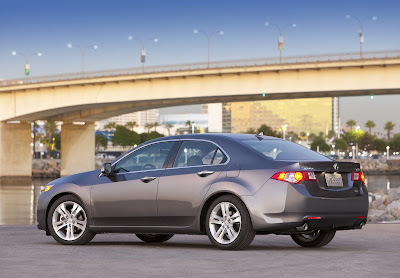 All 2010 TSX models feature a state-of-the-art double wishbone front and multilink rear suspension system to provide excellent ride, handling and control. The new V-6 model's independent front suspension receives firmer springs and revised calibration for the dual-mode suspension dampers. The new suspension generates a level of sporty handling that is synonymous with the mission of the new V-6 model. *For 2010, all TSX models benefit from revised EPS programming to deliver crisper steering response and improved "on center" feel. The 2010 TSX comes standard with 17x7.5-inch 5-spoke aluminum wheels and Michelin Pilot HX MXM4 P225/50R17 all-season tires developed specifically for the vehicle. The TSX V-6 model is upgraded to 18x8-inch aluminum wheels with a split 5-spoke design that are fit with performance minded Michelin Pilot HX MXM4 P235/45R18 all-season tires. All TSX wheels have a clear-coat aluminum finish designed to compliment the exterior color choices. 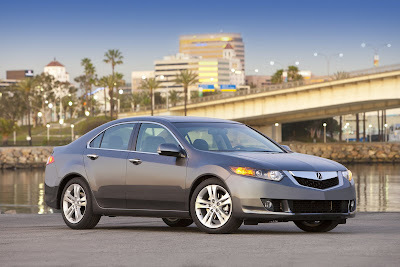 All TSX models make use of a chassis that includes a closed-channel cross-braced roof structure and inside frame rails. Along with a stronger rear bulkhead, the closed-channel cross-braced roof structure yields a more rigid and vibration-resistant structure. The first use of inside frame rails for any Acura model help tailor the aerodynamics underneath the car for improved fuel economy, lower emissions and reduced noise. In addition, new A-, B- and C-pillar separators improve the TSX's quietness over rough roads and at high speed. 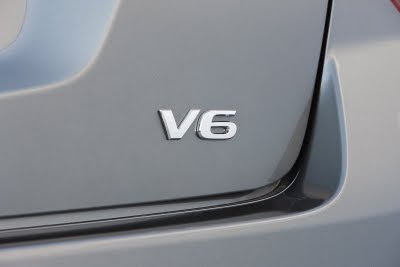 The TSX V-6 model features expanded use of Acura's Electronic Control Mount system for the engine and transmission that delivers more control over drivetrain generated NVH. Also part of the TSX V-6 package is a new Active Sound Control system that is much advanced over Acura's previous Active Noise Cancellation™** (ANC) system. Whereas ANC dealt with the elimination of low sound pressure entering the cabin, the new Active Sound Control system has a much broader range including the elimination of unwanted high frequency noise. The Acura TSX leads the way in safety with its Advanced Compatibility Engineering™ (ACE™) body structure. ACE™ improves the dispersal of frontal crash energy through the use of load-bearing frame structures that better match the TSX with other vehicles of different sizes and with different bumper heights. Simply put, ACE™ helps maximize the effectiveness of the TSX's front crumple zones, better dispersing crash forces before they reach the passenger compartment. Exterior features designed to help improve safety include daytime running lights (DRL), pedestrian-injury mitigation features such as a deformable hood, hood hinges and windshield-wiper pivots, and a 5-mph front bumper and 2.5-mph rear bumper. The 2010 Acura TSX achieves the highest ratings in both government (NHTSA)** and independent (IIHS) crash testing - including garnering IIHS's TOP SAFETY PICK. It is about time altho a turbo would have fit better in today's green market & help differentiate it from the TL/RL. I agree with what you are saying. Before the 2nd gen TSX came out, I thought it was going to come with a turbo from the RDX.